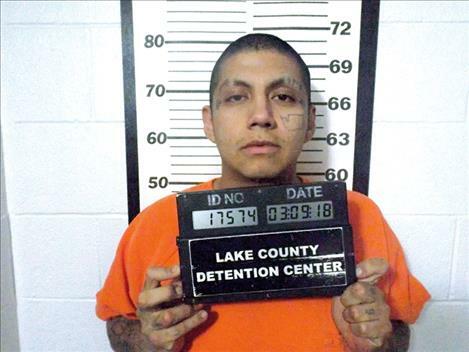 POLSON — Clifford Old Horn, a 31-year-old St. Ignatius man who once had a Lake County murder conviction overturned by the Montana Supreme Court, has been sentenced back to the department of corrections for once again violating terms of his probation on a separate matter. Old Horn has been down this road before. According to court records, he was convicted of burglary, theft and deceptive practices that occurred in the Charlo and St. Ignatius areas in 2005. He was sentenced on the burglary charge in February 2006 to the department of corrections for 20 years with 15 suspended, and 10 years with the department of corrections each for the theft and deceptive practices with all that time suspended. He was also ordered to pay restitution to his victims in the amount of $18,811.07. Old Horn would be re-sentenced two more times for violating the terms of his probation. During one of his incarceration periods, Old Horn made a jail house confession to the July 7, 2005, murder of Harold Mitchell Jr. In that matter firefighters were called to a structure fire at Mitchell’s home on Mission Creek Lane. The body of Mitchell was found during suppression efforts. An autopsy showed Mitchell was the victim of a homicide. His carotid artery had been severed. Old Horn claimed that he was present during the murder and implicated three other men in Mitchell’s death – Nathan Ross, Nigel Ernst and Kyle Brown. Having only Old Horn’s words against Ross, Ernst and Brown, then Lake County Attorney Mitch Young used Old Horn’s own confession to pursue a deliberate homicide charge against him. Old Horn took that case to trial on June 24, 2011, and was convicted of Mitchell’s murder. He appealed the decision and the Montana Supreme Court overturned the conviction ruling that a pre-trial hearing should have been held on the defense’s motion to suppress the jail house confession. Judge C.B. McNeil held that hearing in January 2013 and reversed his own ruling making Old Horn’s confession inadmissible. There was no other evidence that put Old Horn, or anyone else, at the scene of Mitchell’s murder and the case was never re-tried. Old Horn would continue to struggle with terms of his probation and was recently arrested in Spokane, Washington, on drug and theft charges that were later dismissed, although he did test positive for methamphetamine. Judge James Manley warned Old Horn that he was going to sentence him to the Montana State Prison for 10 years with no time suspended in accordance with a recommendation made by probation and parole. Old Horn, who is now adorned in gang tattoos having spent most of his life in and out of custody since the age of 19, thanked the court for allowing him to discharge his sentence. He also told the judge that he made the choices that put him where he is, he made the decision to get the gang-affiliated tattoos and that he will have to deal with those decisions in prison. He told the judge he is not afraid to work and pointed out that during his incarceration he was able to pay $8,000 of his more than $18,000 restitution owed by earning 25 cents an hour working in the prison’s kitchen. He said it’s the only job he ever had and that he doesn’t know how to file his own taxes and was never taught the life skills necessary to make it in the world outside of prison. Learning life skills and getting treatment for his addiction has been something his attorney Eldena Bear Don’t Walk has been advocating for. Judge Manley told Old Horn that the statement he gave the court was enough to change his mind in regard to sentencing. The judge sentenced Old Horn to 10 years with the state’s department of corrections with 5 years suspended and a recommendation for drug treatment.